Ribbon cutting at business location to be printed in Leader-News at our expense. Chamber can travel to ribbon cuttings within a 25 mile radius of El Campo. (Any out of town businesses can take picture at Chamber office). Ribbon cuttings will also be shared on the El Campo Chamber of Commerce Facebook page, Instagram, Twitter and emailed to our membership. Ribbon Cuttings are for new businesses, new location and milestone anniversaries. Recognized as new member on Chamber Facebook page. Receive window decals and complimentary holiday signs. Complimentary 1-page full color email blast as new member to Chamber membership. After first ad, subsequent flyers are $40. Can place brochures, coupons, business cards, etc. in Chamber lobby, visible and available to all visitors. Can place coupons, business cards, flyers and brochures at Chamber tourism kiosks located at Mikeska’s and Pinchers Express on Hwy 59. Your business will be referred as individuals inquire about services through phone calls, walk ins, website and social media . Use of Chamber Logo in your advertising to increase business credibility. Listed in Membership directory portion of our Experience El Campo magazine and opportunities to advertise in this tourism and relocation guide. Members can list multiple categories for a one-time $5 fee. 7,500 Experience El Campo are annually distributed. Advertised on our web site under your business category, and linked if your company has its own web site. Connect with Chamber on Instagram and Facebook to share business information. Advertising Sales on "Hot Deals" page of website. Post employment opportunities to Chamber website. Events Calendar to post events. Members are given the opportunity to market their business through various sponsorship and advertising opportunities. Opportunity to sponsor Chamber of Commerce Board of Directors Meetings. Receive government and local updates via email from the Chamber. Access to Chamber resources, including Texas Association of Business HR Compliance Library. Board Room access to host business meetings. Ask staff for more details. Chamber Business Blenders at no cost. Complimentary advertising for these events. Opportunities to host and attend our popular Business Blenders to maximize exposure for your business. 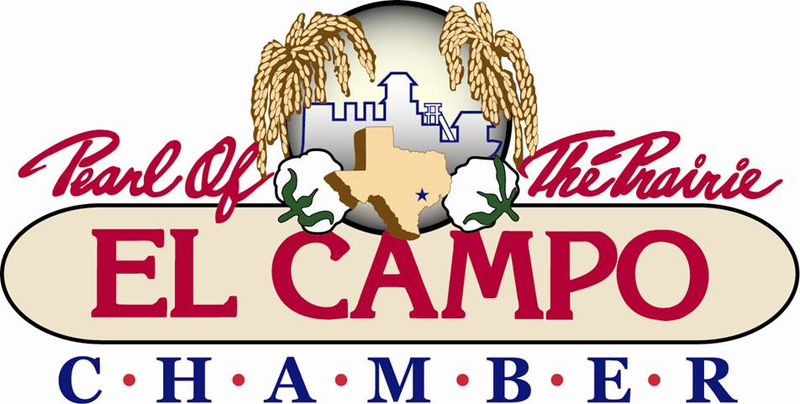 Opportunity to join El Campo Chamber Ambassadors for networking purposes. Opportunity to submit bids for Chamber events. Invitations and/or tickets to Chamber events (ex. Crawfish Boil, Gala, receptions), which are major networking opportunities. Business Workshops, Luncheons, Seminars - designed to provide information to all sizes of businesses to improve operations, increase profits, learn new skills and keep updated on legislative issues. Recognized at Annual Membership Appreciation Crawfish Boil as a new member joining. This event hosts approximately 1,000 members each year. Each member receives 2 complimentary tickets valued at $30 each with their paid membership. Meet and network with elected officials at Legislative Luncheons. Can put promotional items and coupons in our Welcome bags for new residents of El Campo. Mailing Labels of the Chamber’s membership list is available to purchase in label format and used only by members. The mailing list is $50 and includes each member’s main representative (over 500). *Retailer chamber members can participate in Annual Hometown Holiday Shop Hop, Small Business Saturday, Cupid's Chocolate Trot and other Shop Local campaigns. Discounted Christmas Mall and Prairie Days pricing. Please ask staff for assistance utilizing any of the benefits.